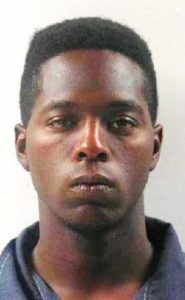 COVINGTON—Demetric Q. Sowell, 24, of Bogalusa, has been sentenced to 50 years in prison without the benefit of probation, parole, or suspension of sentence for attempted first degree murder, armed robbery, and armed robbery with a firearm. District Judge Richard A. Swartz, Jr., issued the sentence July 26, after Sowell pleaded guilty to the charges. Police then were notified that some men had fled another convenience store in a white Chevy Impala after trying to use the credit cards. Police spotted the vehicle, which led the officers on a short chase. The car crashed, and a passenger got away. Officers arrested the driver, Trevonne Mingo, and a juvenile and blocked off the area to search for the passenger. Officers tracked down Sowell at his girlfriend’s house. Mingo, who admitted to hiding the gun, was charged with accessory after the fact. Sowell also gave a statement, admitting to his crimes. Swartz sentenced Sowell to 50 years on the attempted murder charge and another 50 years on the robbery charges with the sentences to be served at the same time. Assistant District Attorney Jason Cuccia prosecuted the case.